The price above is an estimate and includes shipping. be notified via SMS and confirm their final price. Have something specific in mind or want to collaborate? Artisans Notified! We will provide you with the final quote within 24 hours via email. Oops! Something went wrong. Sorry, please email hello@theanou.com with your request. 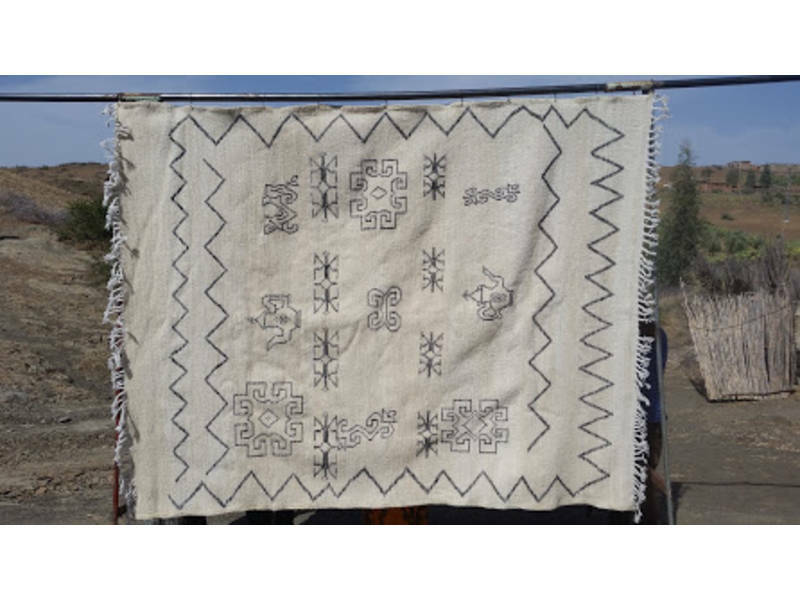 Beni Ourain style rugs are pile knot rugs intricately designed and are used as two sided rugs in Oued Ifrane. There is the summer side, when the pile side is placed face down on the ground to keep things cooler. During the winter, the pile side is placed up to keep things warmer. 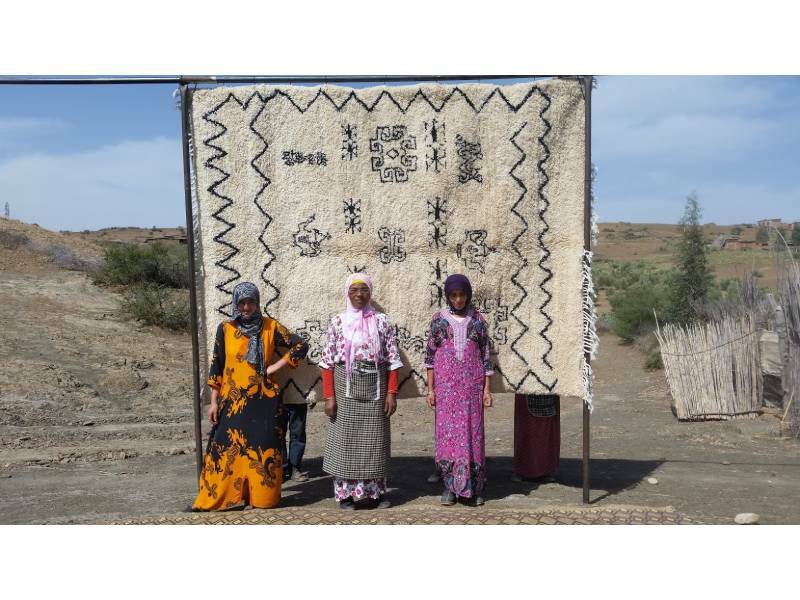 You can find these carpets with natural wool from the local sheep or cotton yarn bought from the village market. 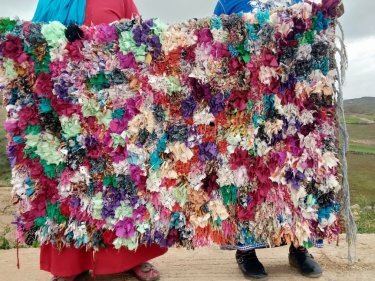 Depending on the size of the rug, it can take weeks to create. Each knot needs to be individually tied and cut, so one person is only able to create a meter in two weeks. 10430Dh: This price includes shipping within Morocco. To order, e-mail us at hello@theanou.com and we will help you with payment options. 10430Dh: Le prix inclut la livraison au Maroc. Pour passer commande envoyez nous un message à l'adresse hello@theanou.com et nous vous présenterons les différentes options de paiement. Want to visit Cooperative Azta in person? The cost is $10 USD per person, all of which is donated to the cooperative. Visits include tea, snacks and work demonstrations! Fill out the form below and we'll send you additional details and payment options when artisans confirm your time. 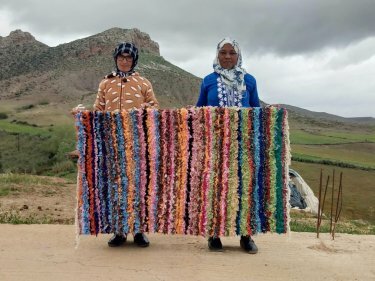 Itto Mahboub was born in 1984 and never attended school, but as a young girl she learned the art of ... show more Itto Mahboub was born in 1984 and never attended school, but as a young girl she learned the art of weaving from her mother. 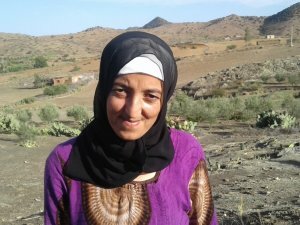 At an early age she married and became a mother to three children and now plays a valuable role in the cooperative. 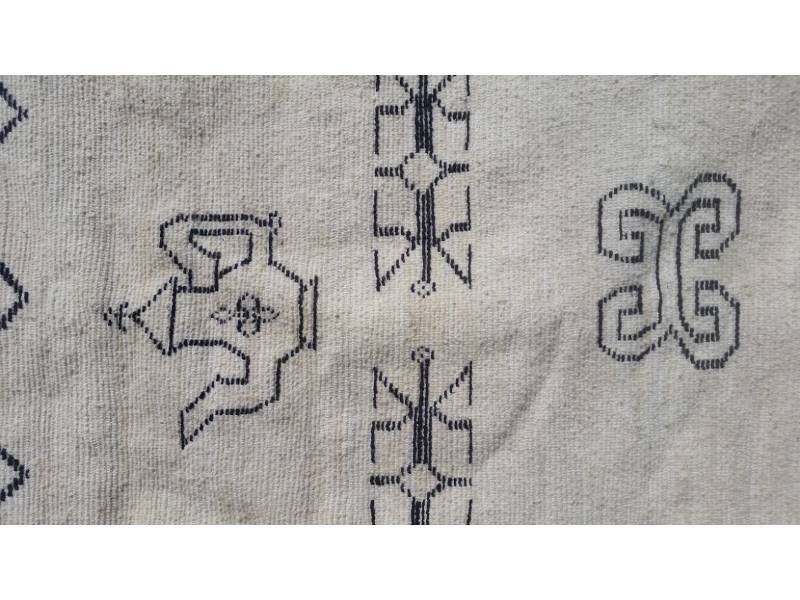 Cotton is used to create the warp of this item. While warps can be made ... show more Cotton is used to create the warp of this item. 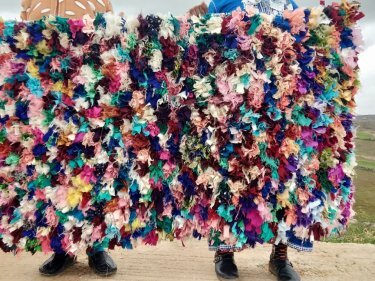 While warps can be made using wool, cotton is more commonly preferred because it helps ensure the rug shape does not warp over time. Wool from this area is of medium to long length. Medium to long length wool ... show more Wool from this area is of medium to long length. Medium to long length wool reflects the hot summers and cold winters, though not as extreme as the High Atlas. This wool length is important and medium to long length ensures that that the threads of wool are durable and do not overly shed. 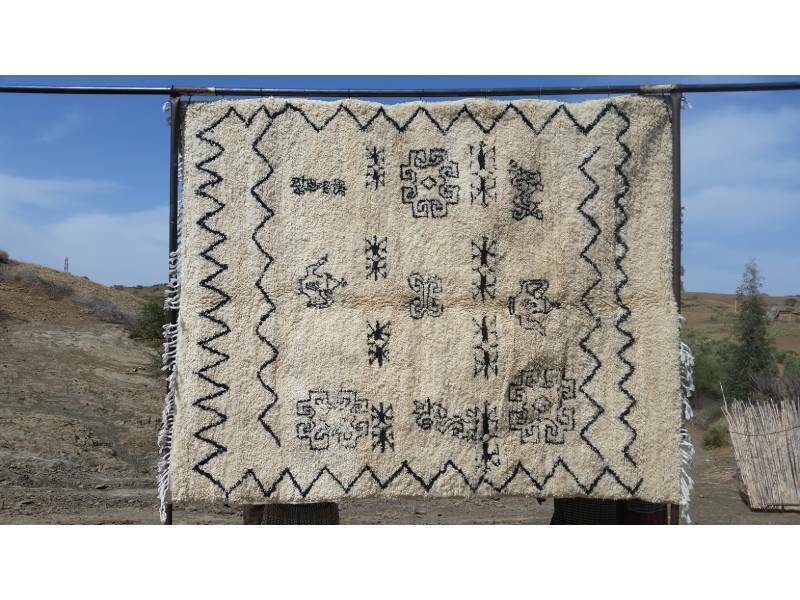 This is comparison to short wool from southern Morocco, which can shed much easier as the threads as the wool fibers are not long relative to else were in Morocco. 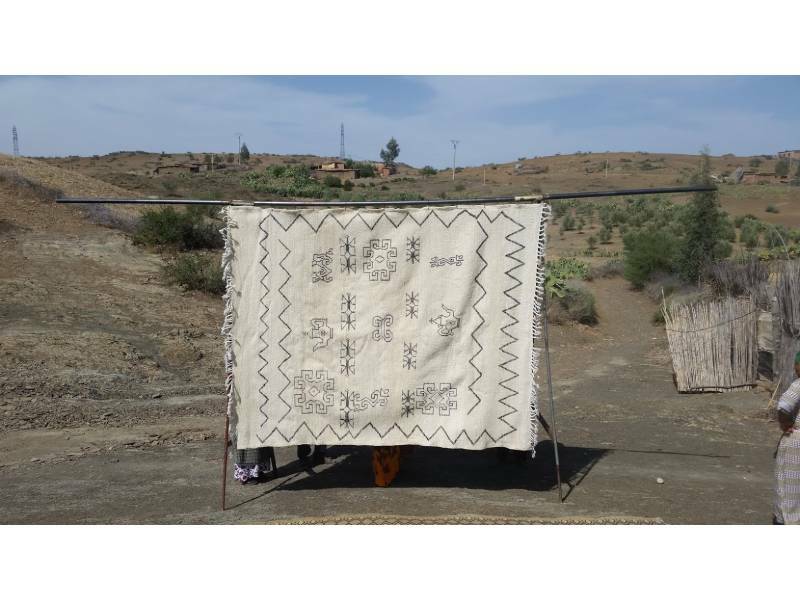 Further, wool in the High Atlas is longer with creates highly durable thread. So while long thread does not shed, it also does not create any fraying at all. Wool from Mrirt strikes a popular balance between durablity, tightness of thread, while still just short enough to provide a gentle fray that is highly sought after. This set of wooden paddles studded with very thin nails is used to take the ... show more This set of wooden paddles studded with very thin nails is used to take the partially combed wool and create fine sheets of wool used to create wool string. Azta uses metal looms provided by the Ministry of Artisans at a local weaving center. ... show more Azta uses metal looms provided by the Ministry of Artisans at a local weaving center. However, if the women decide to weave at home, they're woven on a traditional wooden loom.